I hope you enjoyed your day off. I know I did, but I somehow managed to injure myself. Not sure how it happened, but it's making tonights project a little difficult. And what is that project? Brewing beer. Yes, M and I are at it again... and hopefully we don't screw it up. 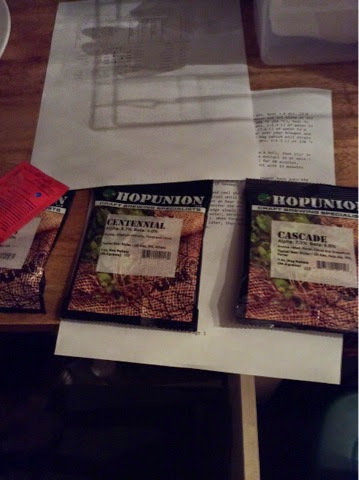 M's trip out to Michigan for the annual Homebrew Festival and hanging out with Brian Wiggs from Dark Horse brewery may have been the catalyst for his wanting to break out the kettle, but I know the hop picking for Saranac is what did it for me. That was last week and I still need to write about it. And I am pretty sure I will at some point. I don't have to point out the obvious, but I haven't been writing much. Oh sure, I posted some crossfit workouts (which I stopped doing but may start up again)... but I just wasn't motivated. No spark... nada. But this month let's see. Maybe I can get things started again. I would think so, since I have some interesting food related things about to start. On Wednesday. So you'll have to wait until then. Back to the beer. My sister purchased some hops and yeast for M earlier in the year and we are finally breaking into the stash. 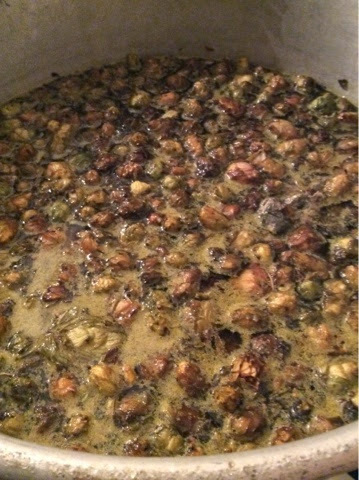 We acquired some fresh hops recently and M is just about ready to "wet hop" them. Which is what you call the addition of fresh hops. Why they don't just call it "fresh hopping," I don't know. It would be understood. But I am new to the brewing thing. Maybe I'll buy a book. Or if SCCC was cool, they would offer a beer making class... or classes. There is that one school in the area that will, and the CIA is opening a brewery. Gotta jump on while it's still hot... right?